Last week, I purchased the new Samsung Chromebook. I had been hearing lots of good things happening in schools that have Chromebooks, and, as a Google Certified Teacher, I decided to learn more about them. I waffled back and forth before deciding which machine to buy. Originally I was enticed by the VGA-out on the Acer for presenting and the Ethernet port to hook it up to a network, but the 3.5 hour battery life and extra weight of the Acer made me change my mind. However, I believe, in a school setting, the Acer Chromebook would make a good teacher machine. Since it would probably be plugged in, the teacher could take advantage of the larger hard drive, the Ethernet port, and the VGA-out for presenting and not worry about battery life. I decided on the Samsung and was not disappointed! It is decently speedy and has a great keyboard and trackpad. (One kind of weird thing on the Samsung is the letters on the keys are in lower case!) I went to Best Buy to see the Acer and the Samsung side-by-side, and the glossy screen on the Acer popped and seemed to be more readable. The matte finish and not-so-bright screen on the Samsung took a little getting used to, but it seems to be usable even when the sunlight is shining right on the screen and there are no reflections like those on the glossy screen. Of course, it is not about the hardware but about the move to computing in the cloud. The Chrome OS brought over all my settings from my Chrome browser on my computers, so I had all my "stuff" right away! I then took the time and went through the Chrome Web Store and installed other apps and extensions for things I knew I would need, like an image editor, a Twitter tool, and and FTP client. There are tons of applications and utilities available that can be run right in the browser! The camera on the Chromebook even allows you to record directly into YouTube! There is a cool Remote Desktop plug-in, which allows you to control your home computer (or any remote computer) from the Chromebook. You have to install software on the other computer for it to work, but it works great! With each Chromebook purchased (at least right now) you get upgraded to 100 GB of Google Drive storage. Getting used to using Google Drive for file storage, and not just Google Apps, is a different way of thinking for me. You can save and access files off an SD card in the slot, too, but using online storage is so much easier! When I am not in a wireless environment, I can still work on various Google apps, like Google Docs, using an off-line version of these apps. When I get back into WiFi, the items sync with my Google Drive. I have not yet been able to print. One needs to use Google's Cloud Print to do so, and, although I can see my printers, they are grayed out. I am assuming it is something in my networked printer set-ups and not the Chrome OS itself. 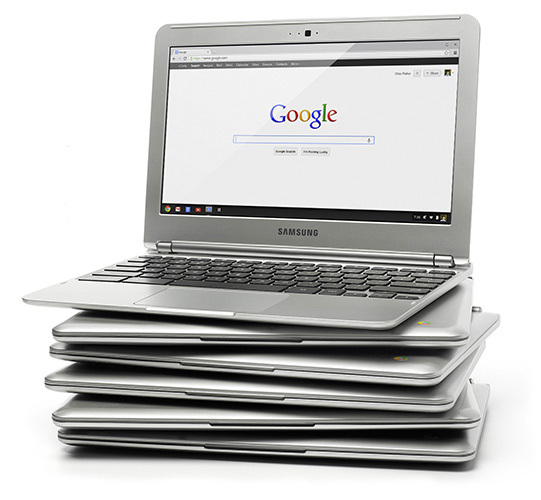 With the cost going down on these devices, I am starting to get questions about the benefits of Chromebooks over netbooks and tablets for the classroom. At much the same price point as a netbook, you really get a better experience on a Chromebook, in my opinion. The browser becomes transparent to the user and everything works smoothly. The 10" tablets are appreciably more money than the Chromebook, although some of the 7" tablets are less or just a bit more in price, so, if you are comparing apples and oranges, the smaller tablets and the Chromebooks are similar in price. The battery life of the Samsung is a big plus, too. It can last an entire school day without recharging. Of course, most of the tablets can, too. And there are many apps on a tablet that are not dependent on Internet access, so tablets come out ahead in that respect. But, the "real" keyboard on the Chromebook is seen as a useful thing in some user's eyes. One point that really is evident about the Chromebook is the ability of multiple users to use the same machine without any worries of getting to someone else's data, or special set-ups, or any worries at all! Shared netbooks and tablets do require some finagling at times if there are multiple users. If a school is supporting a 1:1 initiative, then this point does not make a big difference in decison-making. But for the many schools that go with the "cart o' devices" model, the use of a Chromebook takes all the worry and work out of sharing. Is the Chromebook as cool as an iPad? No. The touch interface and the wonderful apps for the iPad that making you "feel as one" with the device cannot be beat. But, for schools considering an alternative, give the Chromebook a try in a pilot project You will definitely be pleasantly surprised! Thoughts? Things you want to share? Leave me a comment!